You can easily adapt this recipe to accommodate to your preferences. For instance, I LOVE onion but my husband doesn’t, so I usually make one half of the french bread with onion and the other without. If you are ever in a hurry for time, whip these up. The prep time is seriously 5-10 minutes and bake time is 15 minutes. You could easily have dinner ready and on the table in 20 minutes flat start to finish! This meal is DELICIOUS and can be ready in 20 minutes flat from start to finish! Cut french bread loaf in half lengthwise. Pour half of the BBQ sauce on the top of one half of the french bread loaf and pour the other half of BBQ sauce on the second half of french bread. Evenly distribute 1 cup of shredded chicken onto each french bread half. Evenly sprinkle chopped onion between the two french bread halves. Evenly sprinkle cilantro over the tops of both halves of french bread. Evenly sprinkle 1 cup of mozzarella cheese onto each of the french bread loaf halves. Place french bread pizzas on cookie sheet and bake at 350°F for 15 minutes or until cheese has melted and pizza is heated through. Looks so good!! 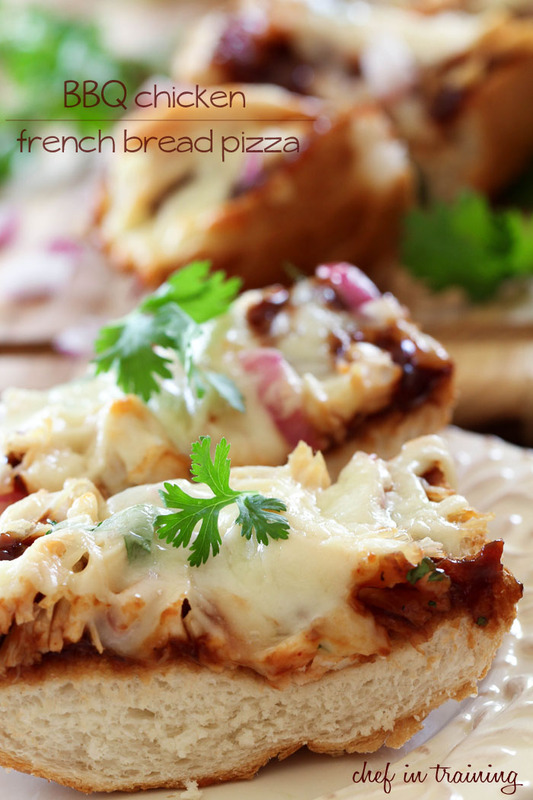 I love BBQ chicken pizzas, but the super easy french bread version is just too good! Making soon! MAKING THIS on our next Friday pizza night. Which sadly won't be this Friday or the week after (traveling!) but it WILL be happening soon. Nikki, we looooove bbq chicken on pizza!! I love making French Bread Pizza and I don't know why I didn't think of this before! What a great way to spice up a quick weeknight meal! I love BBQ Chicken Pizza! This looks fantastic on French Bread! I just love french bread pizza, so yummy and quick and easy. This looks like such a good idea, will have to give it a try. You had me at french bread! I'm in love Nikki! P.S. Can't wait to see you on Friday! 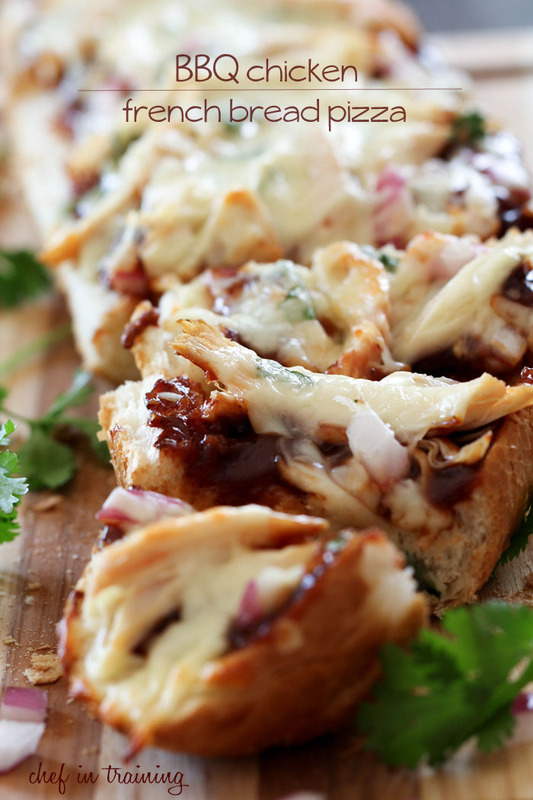 French bread pizza is the best, especially with a bbq chicken combo like this! I love how easy it is to make too! How do you recommend shredding your chicken? Do you boil it or just pull it apart after you cook it? I love French bread pizza! And English muffin pizza. My husband will want jalapenos on his half. You should try this with smoked gouda! It's stellar. OMG! this looks amazing---this is my husbands favorite pizza! I MUST try it out! Thanks for this GREAT post! Ooooh perfect. I bought chicken breasts and a baguette for dinner and I've been looking on the internet for hours for a recipe to use both. Thanks! !